PRESQUE ISLE, Maine — Adults and youngsters from the area already are looking ahead to February, when the Nordic Heritage Sport Club will host the eighth round of the International Biathlon Union World Cup. About 300 athletes from 32 countries, as well as a European media contingent, are expected for the only U.S. stop of the international biathlon competition that tests both cross-country skiing abilities and shooting skills. In October, Towle traveled to Oslo, Norway, with her husband, Paul, president of the Nordic club and a biathlete when he was in the Army ROTC and Maine National Guard, to meet with delegates and volunteers from around the world. This winter the World Cup Biathlon will take place in nine rounds from November through March, in Ostersund, Sweden; Hochfilzen, Austria; Pokljuka, Slovenia; Oberhof and Ruhpolding, Germany; Rasen-Antholz, Italy; Canmore, Canada; Presque Isle; and then Oslo for the championships. As many as 60 million Europeans are expected to watch the sport on TV, and the afternoon races in Presque Isle will be broadcast live internationally, during prime time in their time zones, Towle said. Along with the 2016 championships, the races will begin to determine contestants for the Winter Olympics in 2018. Local educators also hope the event will be a great chance for youngsters to learn about the world. Thanks to a partnership of school districts, the Nordic Heritage club and Katahdin Trust Co., elementary schools are sharing digital curriculum using the IBU World Cup as lesson content on geography, culture, science, math and health — taking students on virtual tours of countries, such as Sweden, Austria, Slovenia and Italy. The youngsters also will get to go outside to ski and to attend the races in the hills of the Aroostook River Valley. “We’ll try to adopt one or more athletes, and focus on their countries, their customs, their food, their languages, and try to learn as much as we can before we go the races,” said Robin Norsworthy, a fifth-grade teacher at the Zippel Elementary School in Presque Isle. They’ll also look to learn about the stories of the athletes, and maybe have a chance to talk with them in between the races, Norsworthy said. 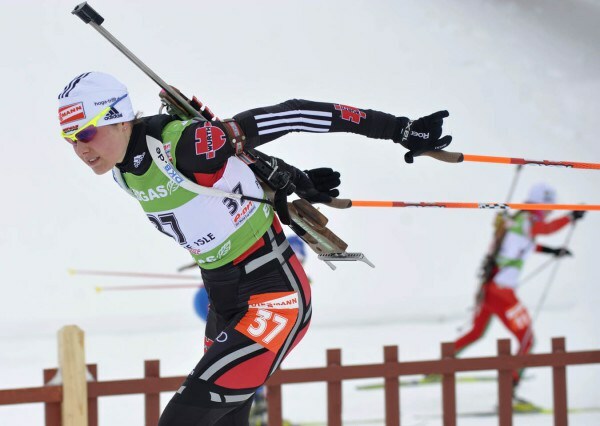 The digital curriculum guide, sponsored by Katahdin Trust, is based in part on Biathlon-related content written by Karen Sanger, a biathlete and former teacher, in 2004, when the IBU came to Fort Kent. Elaine Hendrickson, a former Presque Isle Middle School teacher, helped adapt that content as part of the biathlon’s local volunteer network. In Presque Isle, the competition will depend on the work of some 500 volunteers, and as the first major event hosted by the Nordic Heritage Sports Club since its separating from the Maine Winter Sports Center, it also will be a way to build support for the four-season mountain trail center. “This is a fundraiser that keeps the doors of Nordic Heritage open so that we can keep the four-season community programming going, with mountain biking, hiking, geocaching, kids and adults learning to ski, snowshoeing, local events and all kinds of other outdoor activities,” Towle said.